Other Products by Giant Sports. Search other Acetyl L-Carnitine products. Giant Sports L-Carnitine L-Tartrate Powder is a highly effective performance product that virtually every athlete can use to improve their training sessions or assist with rapid fat loss. Each serving of Giant Sports LCLT Powder provides a total of 2000mg of L-Carnitine L-Tartrate, which is perhaps the most studied form of supplemental Carnitine in humans. Unlike other brands and products, Giant Sports L-Carnitine L-Tartrate does not contain any other “cheap filler” amino acids or ingredients used to “pad the total” serving size. L-Carnitine L-Tartrate has been scientifically shown to increase endurance as well as accelerate fat loss. 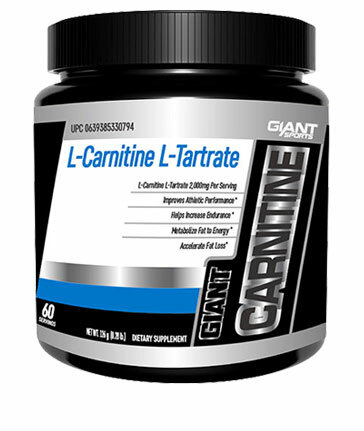 Giant’s L-Carnitine product uses only the highest quality L-Carnitine L-Tartrate available. Tasteless and odorless, Giant Sports LCLT mixes instantly into water or your favorite beverage and it stacks well with Giant RUSH®, Giant PUMP® and Giant BCAA®. Various published scientific studies have demonstrated that L-Carnitine L-Tartrate s may increase fatty acid oxidation, increase endurance and reduce the effects of toxic ammonia build up* – DO NOT SETTLE FOR LESS! Consume 1 scoop (2000mg) mixed in 175 - 235ml of water and take 15 - 30 minutes before your training session or athletic event. Also consume 1 serving as before on non-training days.